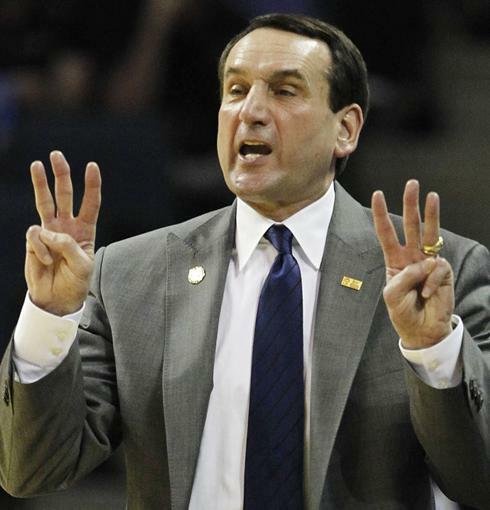 There is no debate that Coach K is a great coach. Let’s just put that off to the side. There is no debate that Duke is a great academic institution. Let’s put that off to the side also. There is no debate that Duke has had and continues to have elite basketball athletes. Let’s put that off to the side. The question that begs is why it is that Duke can do no wrong in the eyes of the NCAA and the ACC? The latest example of this is a tripping issue involving Grayson Allen. Oh, wait. That was a different tripping video involving Grayson Allen. As Oliver Wendell Holmes famously remarked: “Even a dog knows the difference between being kicked and being stumbled over.” And people have a bit more intuition than dogs…. and “instant replay.” Quite obviously, whatever academic credentials Allen has, they are not backed up by even a shred of common sense. Instant replay has been around for a generation (or two) and will show what happened. Or decency. You can see him raise in arms trying to convince the referees that he had not done what he actually did. So not only did he commit the act, he tried to get himself out of the inevitable punishment. If this were a trial, it would not be hard to find Allen “guilty” of both the act and having the requisite intent. (And that is not counting the repeated tripping attempts and that tripping is not particularly manly in its own regard). But why shouldn’t Allen be this way–there is no punishment when it comes to Duke. Coach K is not about to punish Allen (which should be held against the mantra that Coach K is such a “great guy”). And the ACC and NCAA are not going to punish Duke or Allen. The school, coach, and players are, essentially, immune. Duke was allowed to say “we were not aware” with respect to Corey Maggette. Note how Jim Boeheim did not get away with that same explanation and nor will Rick Pitino. Duke was allowed to get away with Lance Thomas putting $30,000 cash down on jewelry and obtaining $70,000 in credit on a “how were we supposed to know” basis, even though the NCAA had JUST punished Memphis and John Calipari for a similar failure to be omniscient. Actually, this Syracuse.com article lists a bunch of similar reasons to question the narrative regarding Duke basketball and Coach K. Check it out. In a world where Bobby Bowden, Joe Paterno, and Jim Boeheim can have wins vacated, it remains perplexing that Coach K has skated despite the above transgressions. And his refusal to do what the ACC would not with respect to Allen should be yet another black eye on his record. That is still a very good record, but not the perfect record that the narrative wants you to believe. Perhaps Coach K will state in 2022 that he should have suspended Allen. But recognizing your mistake years later–i.e. long after the acknowledgement will change anything material the situation–is no different than Allen crying innocent when the videotape proves otherwise. Too little, too late. And the trend also undermines the defense. The bottom line is that… as always, Duke gets away with it. And the fact that this is not surprising is disappointing. Duke’s basketball history is not unlike Notre Dame’s football history–so many names. Only the names are clustered into the past 30 or so years, reflecting the glory days of Duke hoops. So picking the 4th is a challenge. With so many names to choose from, it is hard to choose one. Johnny Dawkins put up incredible points, all before the 3-point shot. Shane Battier was the ultimate glue guy and winner. Grant Hill was a dominant small forward. JJ Reddick was a scorer deluxe, who turned into a great all-around player. Was M.O.P. of the 1992 Final Four. Was First-Team All-American in 1993. Duke retired his jersey in 1993. Hurley now continues the Duke tradition as a head coach for Buffalo. He is one of many Coach K products to elevate to that level, joining Dawkins, Tommy Amaker, Mike Brey, and others. So, with all due respect to the other great players at Duke, the final Duke Mount Rushmore is: Coach K, Christian Laettner, Art Heyman, and Bobby Hurley.